Just imagine you are looking at the latest BMW 335i. You decide which body style you would prefer to imagine – coupe, touring, sedan or convertible – and which colour you prefer (silvery grey, pewter, black and cobalt blue are some of the possibilities). 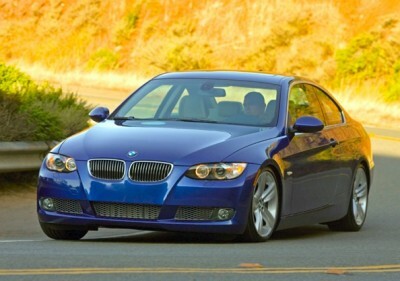 But all versions of the BMW 335i are beautiful examples of the artistic masterpieces envisioned by BMW’s design team. Smooth, gentle curves and a subtle sportiness seem to be the overall theme. Open the door of the BMW 335i, sink into one of the bucket seats and let the door close with a reassuringly heavy thud. It’s up to you whether you want to imagine a passenger or passengers beside you, but you can take a maximum of four in very refined comfort. Breathe in the smell of the leather upholstery and rest your eyes on the well laid out dash (your choice of trim – brushed aluminium burr walnut, titanium matt or natural poplar?). Next, turn the key in the ignition slightly and use the electrics to adjust the lumbar support, back tilt and seat tilt so they support you perfectly (or else just use the memory function). If you wish, you can now turn on the sound system and begin playing one of your favourite 6 CDs ( you’ll find the controls mounted on the BMW 335i’s steering wheel, and whatever music you’ve chosen will filter through the thirteen speakers set around the cabin). Or you may prefer to just keep things quiet for now. This would also be a good moment for you and your passengers to put a handy drink into the cupholders ready to sip later on.. Adjust your electronic seat, fasten your seatbelt and let the engine roar into life. This is why you wanted to keep the stereo silent; you can now appreciate the satisfying purr of the 3 litre inline six motor. Reverse out of the driveway, then begin driving out to your destination (if you need it, the BMW 335i comes with a professional navigation system with an 8.8″ colour monitor with voice recognition and television, but who wants to watch the box when driving a car as nice as this?). The BMW 335i is very quiet inside the cossetting cabin, and the smooth progress is made through a beautifully slick six speed automatic transmission. Let’s imagine that you’re headed to a nice piece of private road where you can test the BMW 335i to its fullest capacity. It’s not too far away, so with an average fuel consumption of 9.6 litres per 100 km, you should still have plenty of petrol in the tank to play around with. Bring the BMW 335i to a standstill, then begin to press the accelerator down. Four hundred Nm of torque from as low as 1300 rpm will thrust the car forward and you back into your seat. In a mere 5.8 seconds, you will be flying along at 100 km/h. But there’s more to come. The BMW 335i has a top speed of 250 km/h, so if you’re imagining yourself in the convertible variant and you have the top down, a quick glance in the mirror will let you know that your hair is well and truly wind-ruffled. You may want to slow down a little as you head off the straight and into some curves, and the ABS brakes with brake assist will help you do this safely. Even so, the dynamic stability control and the speed sensitive steering will keep the BMW 335i securely on the road. The suspension will iron out the bumps, but still allow you to feel what’s going on so you can respond accordingly. Are you having fun yet? You should be! I’m not going to ask you to imagine crashing the BMW 335i. But if you are driving in real life rather than in your imagination, your safety is ensured. BMW always perform superbly in any given crash test, and the 335i comes with all the airbags you would need to the front and side (with an occupant sensor so the passenger doesn’t deploy unnecessarily). So you’ll be safely cocooned. And you don’t need to stop with just an imaginary drive in the BMW 335i. If you’re on the lookout for a medium-sized car that is safe, sporty and speedy, it would be a great choice. Maybe it’s time to live the dream. The ultimate driving experience? I should think so. For any more information on the BMW 335i, or for that matter any other new car, contact one of our friendly consultants on 1300 303 181. If you’d like some fleet discount pricing (yes even for private buyers! ), we can submit vehicle quote requests out to our national network of BMW dealers and come back with pricing within 24 hours. Private Fleet – car buying made easy!